Craft Victoria has moved into its highly anticipated new home at 171 Collins Street. Accessed via Watson Place off Flinders Lane, the new space includes a number of galleries, a retail store, offices and storage space. 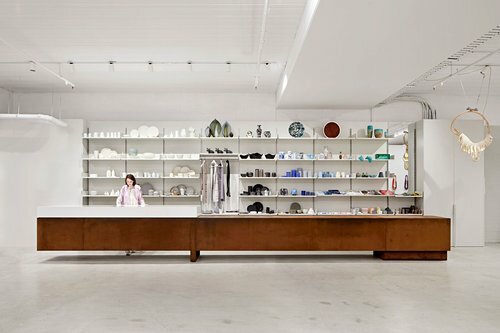 Designed by award-winning Melbourne architect Karen Abernethy, the space features a backlit Foyer Gallery, a Main Gallery and integrates the retail and exhibition spaces. “It was imperative from the outset that Craft’s new home considered first and foremost the makers, the most important component of the organisation’s membership. Consequently, the design and detail of the fit out is paired back and minimal to ensure that the protagonists of the space are the artists and their work. Movable suspended screens allowing a multi-functional and flexible spatial arrangement, an illuminated and reflective atrium that floods the space with light and provides a showcase for some of the most beautiful objects at Craft are some of the features of Craft’s new home, “says Karen. There is also a purpose-built Members Showcase Gallery that will feature the work of 6 members each month. “Everything feels more spacious and open and we’re excited to be able to have the chance to bring an even greater diversity and range of works to the public. We want to celebrate the depth and breadth of our members’ work”, says Melissa. The multiple gallery spaces also give Craft Victoria the flexibility to exhibit more artists and there is an exciting exhibition program in development. The retail store opens on 5 October at 11am with the exhibitions program beginning from 12 October. The space will be officially opened by the Governor on 27 November to coincide with the opening of a major exhibition for Craft Victoria.